With Helix's business model, they don't have to get new customers if the same ones keep buying new tests. Genetic tests that were once only available through doctors are now sent right to your mailbox. PerkinElmer and its consumer genomics marketplace, Helix, have announced that they will soon start selling tests for serious genetic diseases. Helix’s new offerings could make it a strong competitor against genetic testing giant 23andMe, which currently offers a limited array of tests for health conditions (which will soon see cancer risk added to the mix) alongside the ancestry tests that made it famous. 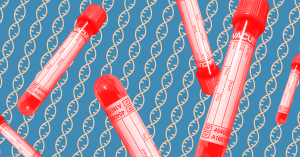 Unlike 23andMe, Helix combines its genetic testing service with offerings from third parties (MIT Tech Review compared it to a “DNA app store”), giving users a wide array of products that utilize their genomic data. Maybe you want to learn about how much Neanderthal DNA you have? There’s an app for that. How about socks, shirts and prints personalized with stripes meant to represent your DNA variants? That’s there, too. Helix’s store even offers a test, from a company called “Vinome,” that claims to select the best wines for you based on your genetics. Helix’s parent company, Illumina, has spent the past 15 years selling the machines that researchers worldwide use to sequence human DNA. But its foray into direct-to-consumer testing speaks to consumers’ insatiable demand for genetic tests to tell them anything they may want to know about themselves, and the tests’ potential to make the company a whole genome-load of cash. By giving consumers the option to continue interacting with their DNA long after that first spit, Helix gives itself a chance to keep making money. Instead of the individual tests offered by 23andMe, consumers can order test after test as Helix partners with new third-party organizations. And after that initial $80 sequencing charge, they only have to pay $29.99 for each subsequent test. Why get new customers when you can get the same ones to keep paying? Since it seems like these companies are the direction that genetics are going, we can at least hope that companies are rigorously evaluation what patients see, and not trading patient trust for an easy buck.